TULSA, OK--(Marketwired - July 20, 2015) - AAON, Inc. (NASDAQ: AAON) was recognized for excellence in product design in the 12th annual Dealer Design Awards Program sponsored by The Air Conditioning Heating & Refrigeration News magazine. An independent panel of contractors acted as judges in the contest that had 107 entries. The company's Low Leakage Damper was the Gold Award Winner in the Ventilation Products category. The ACHR News is the leading trade magazine in the heating, ventilating, air conditioning, and refrigeration industries. AAON Low Leakage Dampers are Air Movement and Control Association (AMCA) Class 2 Certified and allow no more than 10 cfm/sq. ft of leakage at 1 in. wg of pressure. These gear driven economizer dampers are standard on AAON rooftop units. Energy savings can be achieved with low leakage dampers by reducing unconditioned air leakage into the building during both occupied and unoccupied hours. The AAON dampers meet the California Title 24 Building Energy Efficiency Standard damper air leakage requirement. With optional fault detection and diagnostics, the AAON Low Leakage Dampers comply with all California Title 24 requirements. "The recognition of the AAON Low Leakage Dampers in the 2015 Dealer Design Awards highlights the great work of our employees and demonstrates our continuing commitment to designing and engineering innovative and high value HVAC equipment," said Norm Asbjornson, President and CEO of AAON. Winning entries in the Dealer Design Awards are featured in the July 20, 2015 issue of The ACHR News, which is distributed nationally to over 33,000 HVACR contractors, wholesalers, and other industry professionals. 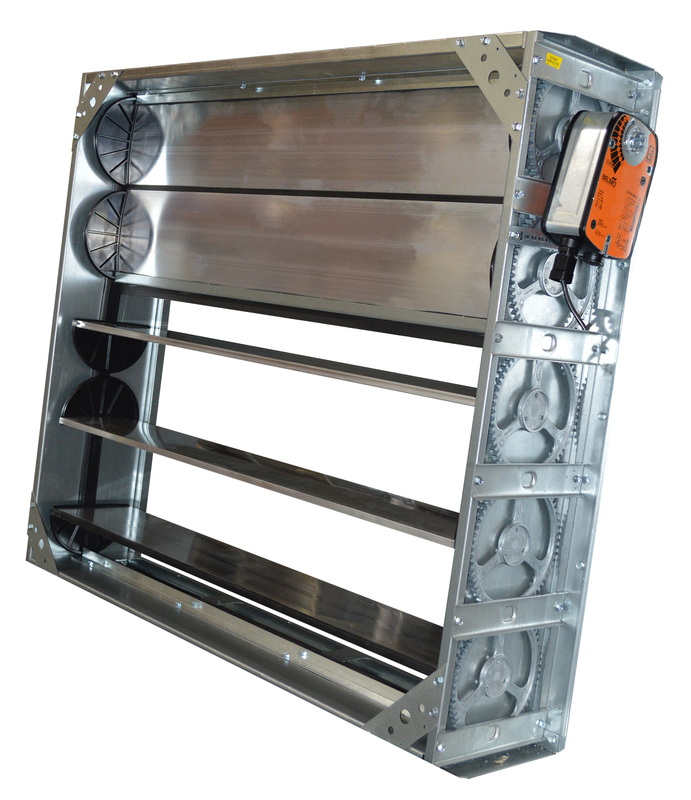 AAON Low Leakage Dampers are standard on AAON rooftop units.